Dogs love going for car rides, and as a dog owner, I like taking my dog along because it makes him happy and I like having him with me. The problem is, when you have to quickly brake or turn a sharp corner, many times our dog is falling off of the car seat and falling onto the floor. Also, if you have a big dog, they sometimes have a hard time getting comfortable or having enough room. Half of them is usually hanging off of the car seat. A seat extender for you dog will help them have a better ride. A dog seat extender is the perfect solution to keeping your dog from falling off the car seat. They give your dog the room and comfort that they need when riding in your car and help keep them from getting injured. Seat extenders for dogs are available as front seat extender for dogs and back seat extender for dogs, depending on what your dog’s preference for riding is. With a seat extender, you will no longer have to stuff blankets and pillows on the floor between the seats to protect your dog. Let me show you my recommendations for dog seat extenders to help your dog ride in comfort. There is a variety of seat extenders for dogs depending on what you are looking for and depending on how heavy your dog is. Always make sure that the weight the seat extender allows is within your dog’s weight. Measure your area where you plan on placing the seat extender to make sure it will fit, and look for obstacles that could affect how the seat extender will fit. A typical obstacle would be if you have a high hump on the center of the floor. Measure width between the back of the front seat and the front of the back seat. Measure your overall width from door to door. 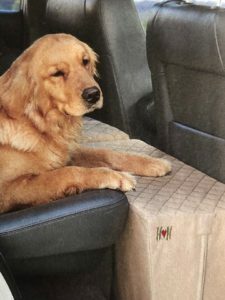 The following 5 seat extenders for dogs are my 2019 recommendations for the best dog seat extenders. This one would be my number 1 choice, but unfortunately it is a bit expensive. This seat extender is made of high-density foam core with a polyester microfiber cover. Cover is washable and available in slate, khaki, and gray. Will fit most cars and SUV’s and has a weight capacity of 150 pounds. This seat extender will also work as a front seat extender for your dog. Measures 13″ high x 25″ wide x 12″ deep. Don’t be fooled by the picture. It shows it going across the entire backseat. If you want a back seat extender for the entire backseat, you will need to purchase 2 seat extenders. You would only need 1 if using it as a front seat extender. Customers love this product, the main complaint was that from looking at the picture, they thought they were purchasing something for the entire backseat and not just one side. Other than that, they all felt it works great. Positive: Works great for large dogs, fits as front seat extender or backseat extender. This is an inflatable platform that fills in whatever the area is that is open between the front and back seats. It provides a flat surface in a car or SUV. Made of PVC backed nylon and holds up to 165 pounds. Electric air pump included. Measures 49″ x 10″ x 13″. This one is versatile since it will fit any size of backseat area. Positives: Fits any sized vehicle, and works well for vehicles with a center hump on the floor. Negatives: It only fits in backseat. Can’t be moved up to the front seat if your dog decides to ride in front. It is also a bit concerning having dog nails around inflatable items. I know I don’t like my dog on any air mattress, because I am afraid he will put a hole in it. This seat extender comes with storage inside to help make the most out of your space. There is also a mesh pocket on outside of extender to hold your dog’s leash. It measures 23.1″ x 11.8″ x 12.2″. You would need 2 of them to cover the entire backseat area. Works as a front seat extender as well. There is no weight limit listed for this product. I would consider it a good fit for small to medium-sized dogs only. Positives: Works as front seat extender and backseat extender. A person could share the backseat with your dog since it only covers have of the backseat. Negatives: Would not fit over a hump on backseat floor. Need 2 to fit entire backseat area. This seat extender has a zipper top that opens to a 6 section storage compartment. It has a durable, quilted waterproof polyester cover that removes for machine washing. Works in front seat and backseat. It requires 2 seat extenders to cover the entire backseat area. Measures 22″ long x 12″ high x 9″ dimension at the base. This seat extender is for dogs 50 pounds or less. Positives: Lowest priced seat extender. Negatives: Not as sturdy as some of the other seat extenders. This seat extender works a bit differently than the other seat extenders I have discussed. It works as a seat cover for the bottom of the seat, a divider/barrier from the front seat and extends the seat so your dog can’t fall down on the floor. It works great for trucks, SUV’s and full sized sedans, and holds up to 150 pounds. It is built with a hardwood interior that is wrapped with comfortable foam padding and enforced by sturdy nylon straps. Includes a storage pocket for dog supplies. Can be installed in minutes and folds into compact square for storage. Positives: Helps keep your car seats clean, offers barrier from front seat. Negatives: Can only be used for backseat. I personally feel that the dog seat extender that allows flexibility between front seat and back seat is the most useful if you have a dog that is sometimes in the front and sometimes in the back, depending on if you have some human passengers. They also don’t necessarily take up the entire back seat, depending on if you purchase 2 of them or not, which allows your children or other passengers’ legroom to sit in back with your dog. Using either a front seat extender or back seat extender for dogs will help your dog be more comfortable and provide them with safety since they no longer will be able to fall off the seat onto the floor. Whichever way you choose to go, using blankets and pillows, half a seat extender or entire seat extender, you will be helping your dog have a more enjoyable car ride when they have more space and can’t fall down. If you have any questions or comments, please leave them below. You can follow justforyourdog.com on Pinterest, FaceBook or Twitter for all the latest updates and information.